Featuring important economic and stock market data since 1906 – it’s an encyclopedia at-a-glance! You can also Customize the 100-Year Century Chart featuring the Dow Jones with your Organization’s Logo or Message! Size Reduced. Wall Chart Size (24″ x 36″) Perfect for Faming. 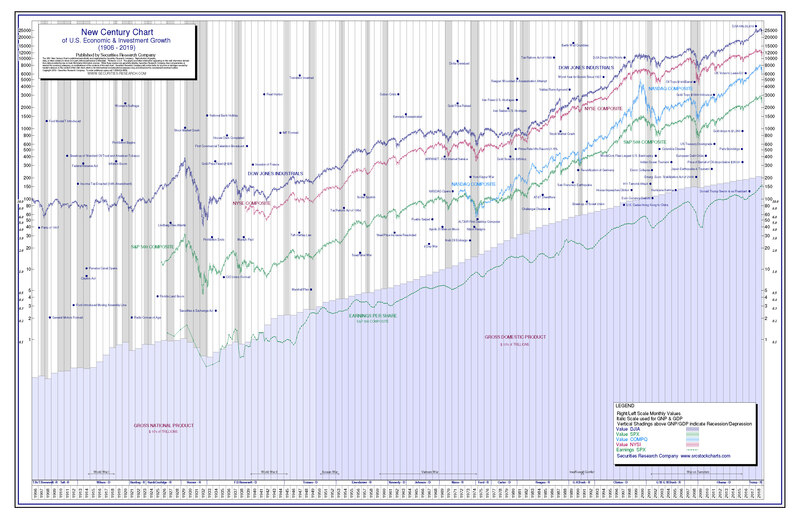 SRC’s Century Chart displays the Dow Jones History and is are the perfect way to see long-term trends, cycles, and patterns at-a-glance. With SRC’s Poster Charts, the wealth of stock market and economic data is presented in large, graphical poster formats, ideal for when you need a snapshot of specific market conditions, activities, or technologies. You’ll find SRC’s Century Chart featuring the Dow Jones chart history an indispensable tool for meetings, conferences, group discussions, or for your own personal use, making it easy to identify data and to spot trends and critical turning points. Order your SRC 100-Year Century Chart Poster today. Bulk quantity discounts are available, and add your company’s message or logo for $49.